In the 1980’s, two traveling museum shows “Inquiry into Fire” and “Israel Revisited” featured Beth Ames Swartz and her work with hand-made paper in a ritual context. Her work was documented in a biography: CONNECTING: THE ART OF BETH AMES SWARTZ, by Mary Carol Nelson (Northland Press, 1984). A MOVING POINT OF BALANCE is a group of seven paintings. They were installed with special lighting, a sound accompaniment, and a medicine wheel created by the late Native American artist, David Paladin. A health crisis became the genesis for A MOVING POINT OF BALANCE, completed between 1981 and 1986. In her quest to heal herself physically and emotionally, Swartz studied color healing, as well as Psycho synthesis. She was also profoundly inspired by sacred sites she visited in Europe and in the Southwest, participating in rituals at each site, including a summer solstice celebration with Hopi elder Preston Monogye, at the great Kiva in Chaco Canyon, New Mexico. 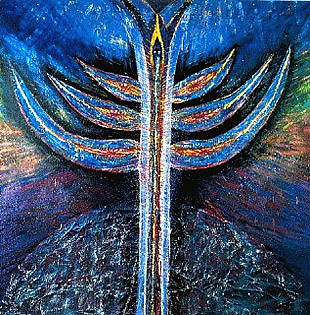 The paintings are based upon the Chakra System, which according to Hindu philosophy are seven centers or vortices in the body, which correspond to the spiritual, physical, and psychic vehicles of a human being. Each Chakra is associated with a specific color. Each painting in the exhibit is meant to be contemplated while the viewer is bathed in a corresponding colored light, with instructions to meditate upon the qualities of each color as a vibrational field. The Chakras are an integrated system, representing different aspects of consciousness: each Chakra is a “window” from which one perceives and responds, from the physicality of the first Chakra at the base of the spine, to the final merging with spiritual awareness at the seventh or “Crown” Chakra. Swartz uses the Chakras as a metaphor for integration, and the title of her exhibition is a reminder that we are always evolving toward wider understanding and equilibrium, always renewing the Balance. A Moving Point of Balance was created as a contemplative, sacred environment. Swartz calls herself a “Bridge Person” - because she believes artists are the best translators for new paradigms. She has sponsored several national symposiums on Transformative Arts, bringing together artists from a variety of disciplines and media toward that end. LR: Your work is about integration, recognizing the essential connections between us. BAS: The understanding of interconnection is very important, because when I know who I am, then I am you. This is the mirroring quality. And engaging the heart is probably the greatest challenge we all face. No individual can disconnect from the whole and survive. It is as if the universe is showing us this, with the nuclear threat, overpopulation, and the imbalance that exists between the masculine and feminine forces within our culture. We have a real opportunity to become fully aware of our interconnectedness. We have an opportunity to create a holistic view, in which there is no blame in the universe, only deeper and wider clarity. I was at a Buddhist retreat for 10 days last spring, with 50 artists from all over the world. The director told us about his people, Buddhist monks, in Saigon during the Vietnam War. The government had broken down; there were bodies on the streets of Saigon, and no one to bury them. So they said their prayers, practiced walking meditation, and then bagged about 20,000 bodies. I have seen that kind of intention in many artists I know, committed to creating a more sane civilization. They offer their gift not only as the work they do on themselves, but as the larger work they participate within. LR: Externalizing the internal work, as a painter does, is a way of changing it? BAS: Right, so it is not denial. Many times in the past 30 years I’ve put emotional violence into my art and thus worked it out. We’re all Hitlers. It’s just that, as in physics, whatever we concentrate energy on will expand. I think it is a question of educating people, sharing information. One way to arrive at a culture breakthrough is to have “bridge” people, people willing to communicate new ideas, new possibilities, in a way that can affect others. Artists can do this. LR: Could you talk about your creative process? BAS: When I work, it is a little like automatic writing….I am sure many artists work that way. You develop your skills and technical expertise, and then work intuitively; you trust the process. It’s a Zen idea: you learn all you can learn, and then go into the studio and forget everything. There is an emptying out, being willing to confront the ambiguity of not knowing. We really do not have a language in this culture for these kinds of experiences. A friend wrote a wonderful book, “The Dancing Healers”. He is a psychiatrist who has worked with Native Americans for many years. Once a Medicine Man asked him what his definition of the mind was, and he returned the question. The Medicine Man replied, “Mysterious”. LR: When you were working on the paintings for A MOVING POINT OF BALANCE, did you plan the imagery before you actually painted them? BAS: No, although I did have some visionary experiences previously. I went to a number of sacred sites, and at the first one two mysterious horses visited me. They remained with me through a long night when I was stranded at the site. They were, in shamanic terms, “power animals”. Later I went to Esalen to study shamanism with Michael Harner. So, it’s been each step leading to another. Synchronicity means the right person or experience will appear. The first painting took a year and a half. I had not worked on canvas for 15 years. When I was working on the painting of the Heart Chakra, I had just separated from my ex-husband. I felt like my heart was breaking. When I looked at the painting, it kept me alive, and I realized it was as it should be. Sometimes you leave parts of yourself in the past, in order to move forward to other aspects that need to be expressed. That does not mean it is bad or good, it just means it is not appropriate for you any more. The first three paintings were also influenced by my work with Psycho-Synthesis, with L.B. Young in San Diego. I visualized myself as a cylinder of light. In the sixth painting, you can also see that form merging. In the seventh, it becomes a rainbow cylinder of light. This is perhaps the closest to ecstasy I have ever come. I tried to recreate that feeling in the paintings, to find imagery to capture it without being trite. In order to recreate the experience visually, I also had to find new materials to embody it, to get that sense of luminosity and radiance, which is why I added crystals to the canvas. Because the work is about radiance. I wanted to make an environment inviting others to enter their own sacred space, to look within in a deeper way, with the paintings part of that experience. My art seems to be my spiritual practice! There is a quality of attention and discipline when I am working that nourishes me on a very deep level, and that is why I feel lucky to be a visual artist, because I can have a record of the movement of my energy and consciousness. Perhaps it does not matter what kind of work you do, what matters is the quality of commitment. And most importantly, love. Certainly, I felt this in cave paintings I visited in France. There are threads in my own work going all the way back to those cave paintings. They were made for protection and for communication. They were part of the magic. It was celebratory art, and a contemplative offering. In our world, we need opportunities to experience this. To remember who we really are. An art that takes away the static, so we can experience other dimensions within ourselves. I feel this is our challenge, not to copy ancient cultures, but to re-integrate some of these qualities in light of who we are now. After I had my experience of being visited by the two horses, I took a course on shamanism and art. I wanted to find those same sources in my own cellular structure, to bring it forward so I could create an environment having some qualities of traditional shamanic environments, and yet also be a contemporary expression.